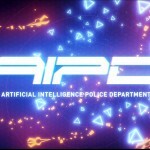 AIPD (an acronym for Artificial Intelligence Police Department) is a top down twin stick shooter in the same vein as Geometry Wars and Ultratron. Luckily, as Xbox One owners we have been spoilt for choice as far as twin stick shooters are concerned. Just how does AIPD fit in to the ever growing catalogue? There isn’t much in the way of a story line in AIPD so I’ll dive right into the gameplay. To begin with, you need to kit out your ship. You start off with the Gatling Gun for your weapon and the Allrounder Modification. As you continue to play and rack up the points, you’ll be rewarded with new weapons and modifications to use. Personally, my favourite combination was to use the Phaser for the weapon and the Automatic modifier which activates your power ups as soon as you pick them up. You get to unlock a total of 6 weapons and 6 modifiers and they offer many ways to play the game based on what load out you choose. 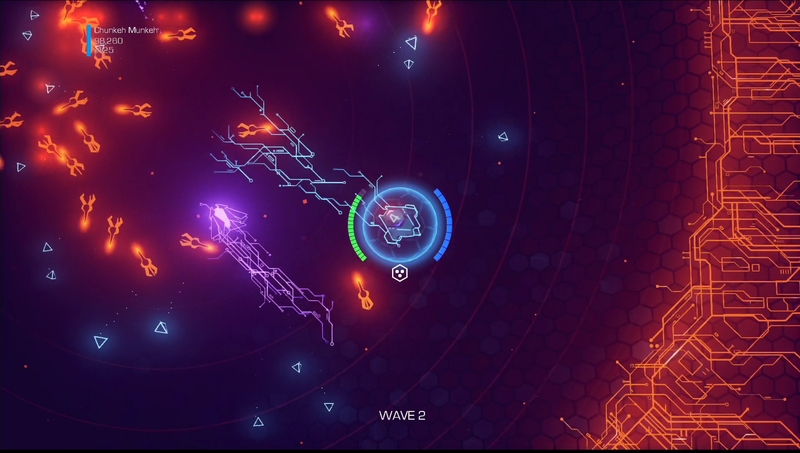 The game throws 15 waves at you that gradually increase in difficulty. Every few waves or so you are introduced to a new type of enemy with different weapons and attacks to keep you on your toes. If you lose all of your health, that’s game over and you have to start over from wave 1. 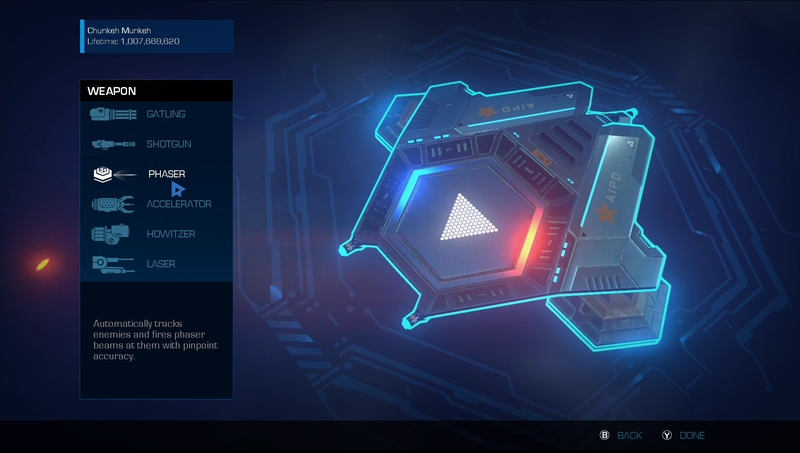 Along with the main mode, there are 4 other game modes you can have a go at which have different modifiers enabled to increase the difficulty, the fourth mode being a custom mode which you can pick and choose which modifiers are enabled for the game. Like with other twin stick shooters, you move around with the left stick, aim with the right stick and shoot with the right trigger. Enemies can sometimes drop power ups to help you along your way and you can activate them with the A button. These power ups range from slowing down time to giving yourself a shield. Lastly, you periodically have Transporters fly across the map which, when destroyed, will drop a special weapon like some missiles or some torpedoes, which can be fired using the left trigger. There are a couple of things that make this different from other twin stick shooters I have played. Firstly, all weapons can overheat, which isn’t to much of an issue on it’s own. But when you combine that with the fact that every time you overheat your weapons, a mine comes flying out of the back of your ship ready to blow you up and take valuable HP from you, it makes you think twice about spamming that right trigger. 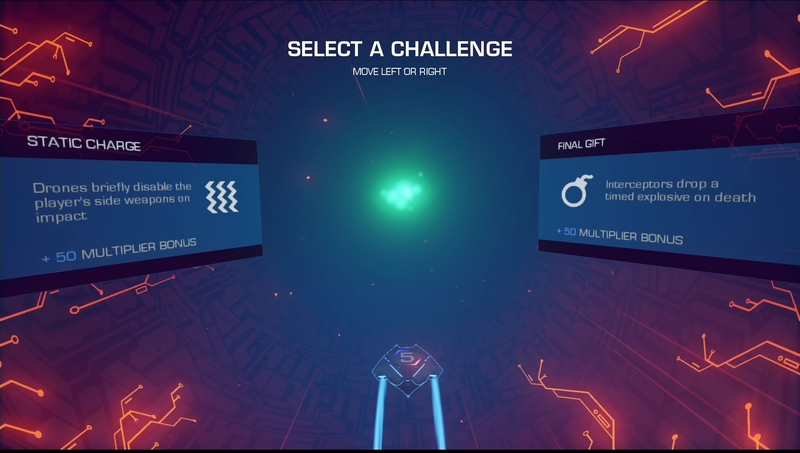 The second and most intriguing difference were the challenges that add modifiers to your game. After every wave you go into some kind of wormhole and you are offered up two choices. These choices are modifiers that increase the difficulty of the game in exchange for bonus multiplier. In total, there are 24 different modifiers and upon completion of a wave, two are randomly chosen for you to pick from. Some of them are almost ignorable like the leak modifier which leaves you leaking multipliers constantly throughout the wave, whereas others can be a complete nightmare to deal with. This opens up the opportunity for each playthrough to be somewhat unique depending on what modifiers you get to choose from which, I must say, was a pleasant surprise. When I finished the game my first time I was a bit disappointed it was over so quickly, but upon playing it again on a harder difficulty I found it just as enjoyable (albeit harder) as my first playthrough. The random modifiers can be a bit frustrating at times though. On a few occasions during my attempts at beating the game on Hard mode, I had the distinct feeling that the game was screwing me over after having a few modifier choices that gave me a major disadvantage towards the very end. This is probably my issue and mine alone though based on how I opted to play the game. AIPD does a great job at catering for different play styles. I opted for the run and gun option and ignored my overheating bar. With my setup I was able to easily work around overheating every now and then and avoid those pesky mines popping out of my backside. Like I said above, I did get burned a few times with the modifiers making my play style very difficult, especially when I had to choose the Short Fuse modifier which shortens the fuse on the mines that pop out when you overheat. I tried other methods as well which didn’t work so well for me but there are definitely many ways to go about AIPD. Something I wanted to touch on briefly that I don’t generally mention in my reviews is the graphics. I was genuinely impressed with how the game was able to portray the retro style graphics but at the same time you know it’s a brand new game using the Unreal Engine 4. I don’t think I encountered a single bit of lag or screen tear at all. I’m not going into any more detail than that because I would be pretending to know what I’m talking about. To be honest, my only real criticism of AIPD would be the length of the game. I know I explained above that there is real replayability due to the modifiers but I would have enjoyed it more if there were more waves to contest with and a few more different enemies to destroy. Or failing that, having a boss fight every 5 waves or so. Instead you get 14 waves against the run of the mill enemies and 1 final wave against the boss. One thing I haven’t touched upon is the local co-op aspect of AIPD. I am a huge fan of local co-op games but it would have been nice to see some online functionality other than the leaderboards (which is a nice addition). From what I got to play in local co-op, the game was as much fun as it was playing solo. Now onto my favourite part, the achievements list. Anyone who enjoys their twin stick shooters and has a decent skill level will complete AIPD with few issues. The only achievement which can be a pain is defeating the boss in hard mode. With practice it isn’t too bad. Other achievements range from not overheating at all through all 15 waves, unlocking all weapons and modifications and scoring 1 billion points. 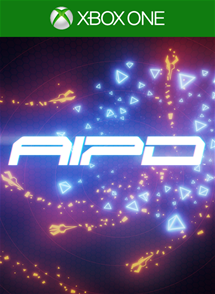 All in all, AIPD is a brilliant top down, twin stick shooter and I would highly recommend anyone who enjoys these games to go and buy it now if you haven’t already. The gameplay is fast paced and enjoyable and the graphics are on point. Although, the game does only have 15 waves and it doesn’t have any online gameplay, the modifiers certainly help to add replayability and the local co-op is a blast. AIPD fits into the catalogue very neatly near the top. A review code for AIPD was provided by the Developer for the purpose of this review.